8Asians’ Joz on the Cover of TIME! Okay, so maybe that’s only partially true. Remember Joz’s hilarious discovery that the blink detection feature discriminated against her and her brother’s Asian eyes? The photo and accompanying story made its way around the Internet, but today, Time featured Joz in their article about racism in face detection technology. I managed to snag an impromptu interview with Joz about her newfound fame and the fate of the camera before she hopped on a plane to meet with President Obama and a representative from Nikon over a beer. Do you still have this racist camera in possession? This racist camera is in the possession of my Mom. 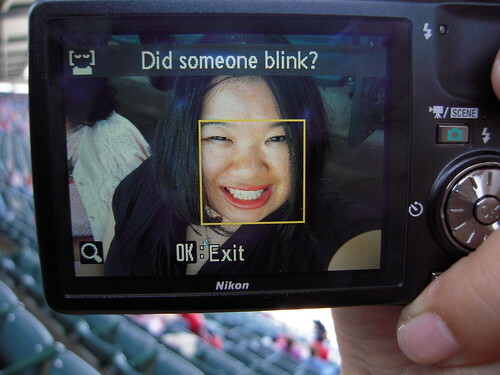 She is non-blink-detecting her friends as we speak. Have you ever confronted this camera for its offensive behavior? I heard that it’s really unhealthy to internalize such anger. So you should really say something to it. How did Time get in contact with you? He went to my blog and read the “contact me” directions. Sent me a note via FB as requested and was really nice and professional. Who’s more racist: Nikon or HP? Well, seeing as Asia accounts for over 60% of the world population w/ the population of Africa trailing behind, I would have to say that Nikon is racist against more people than HP is. Now that you’ve technically “made it” by appearing in Time, what’s next? Oprah? Guest judge on American Idol? All of the above. And I plan to be more famous than Lady Gaga. Look out for the Haus of JozJoz(Joz). Team Coco, for sure. Any friend of Wing Pang is a friend of mine. Who’s more famous now? You or Wing Pang? Wing Pang. He cussed on national TV. That’s still on my “to do” list. Okay, I think the interview is over now. Did I miss anything? Don’t forget to vote for CPAF in the Chase Community Giving Contest on Facebook! Today’s the last day! And congrats to Joz. We can’t wait to see you on Oprah. Previous Previous post: The Best Chinese Restaurants in the U.S.